Independent media services agency USIM has been on a new business tear, and it turns out that at least part of the reason is a new proprietary method it has developed that enables retail marketers to create and target customers based on customized trading zones. 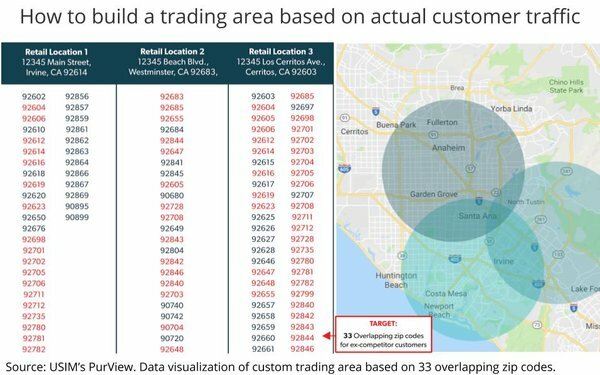 While trading areas are a fundamental part of the marketing and media strategy for most retailers, they historically have been defined by geo-demographic clusters, or more recently in the digital age, by geolocation data derived from services that aggregate anonymized data from users’ mobile apps. “It’s a lot of overlapping data signals that doesn’t represent a single person,” he explains. USIM stumbled upon what effectively is a “single-source” solution while working with a company that opts users into its own application in order to conduct surveys. Jayson was reluctant to disclose the provider for proprietary reasons, but he said the company has more than three million explicit users who opt in to receive rewards in exchange for participating in marketing surveys. Those users also provide their demographic profiles, so in addition to seeing how people travel to and from retail locations, USIM can attribute demographic information to them, which is important for refining media targeting, since all of the data is non-PII (personally identifiable information). While the database is not as big as the scale offered by geolocation data providers like PlaceIQ, Placed, Ground Truth and SITO Mobile, Jayson says it provides a much cleaner, single-source view of how consumers travel during their retail journeys. As a result, USIM is able to dramatically refine and improve the way it defines the trading areas for retail marketers to more precisely match the actual travel patterns of their customers. He says USIM does not utilize that data for targeting and buying media, because the database isn’t scaled enough to be stable for media-buying purposes. But once it defines and customizes each retailer’s optimum trading areas, it works with the programmatic media-buying platforms powered by the commercial geolocation data platforms to target individuals. “The end result is a much more efficient deployment of programmatic and OTT (over-the-top) and other media we can buy with geo tags that is much more efficient in driving traffic to stores,” Jayson says. To date, Jayson said USIM has found considerable improvements in “lift,” or the indicators agencies and clients use to measure the performance of their media buys. He said there so far have been “huge variations” depending on the nature of a retail client, and that they have ranged from improvements of 10% to 50%, but that the rule of thumb tends to be in the “10% to 15%” incremental improvement range. The method -- which USIM has trademarked “PurView” -- currently is only available to USIM clients, and the agency attributes it as being a key part of its recent new business wins with retail clients such as the Crunch fitness centers and West Coast retail chain Howard’s. USIM cannot say whether the method is a unique innovation, but President-Eastern Region Russell Zingale says the feedback it has gotten from clients in new business pitches seems to indicate it may be. “That’s what they’re telling us,” he says, adding that clients mention other solutions utilize aggregate geolocation data, but that PurView is one of the reasons they are moving business to USIM. Zingale says USIM has mainly been using the method for new clients, but it’s in the process of rolling out to its incumbent roster too. He says it has no plans to license or syndicate it.